Thanks for your posts about MA. 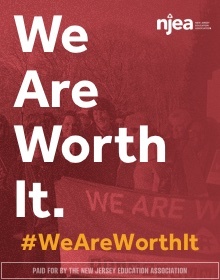 We are in a huge fight here for the future of public schools. 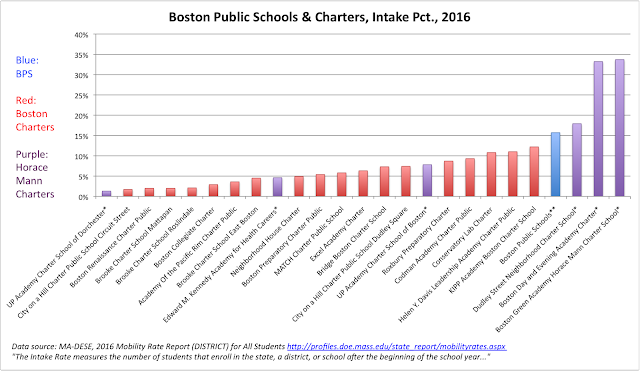 To add to your research...I served on the state Board of Elementary and Secondary Education for 11 years and in MA it is that Board who provides all charter accountability. Prior to 2010 charters did no backfilling. They weren't required to and didn't. 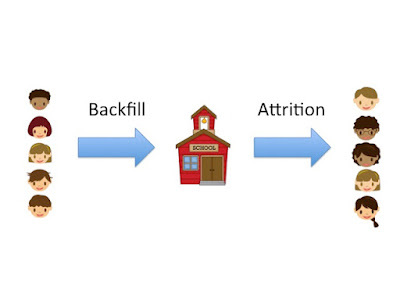 In 2010 an Act Relative to the Achievement Gap was passed and one of its' provisions required schools to start backfilling. BUT and there is a big but...they only have to back fill in the first half of their grade span. 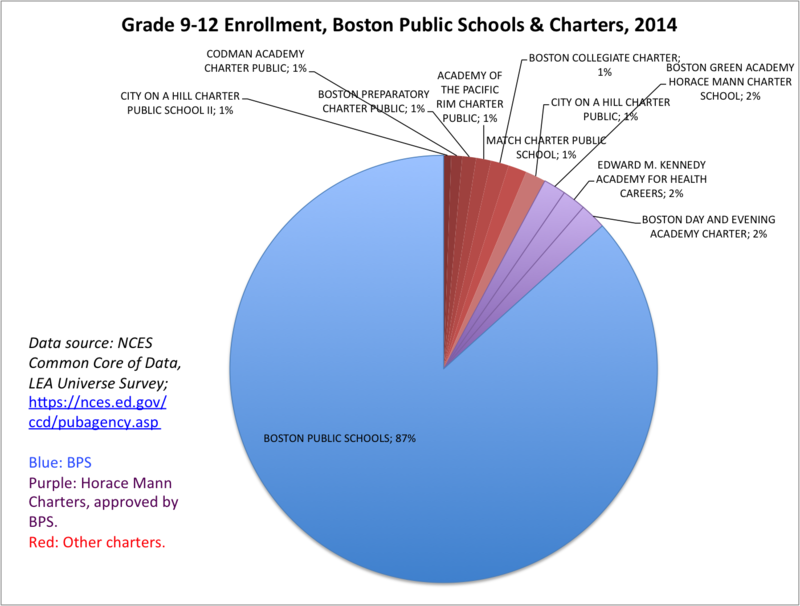 So for a K-6 the charter must backfill in K1, K2, 1 and 2 grade. They are not required to backfill in 3, 4, 5, or 6 grades. In which of those grades is our state test MCAS PARC 2.0 administered? 3, 4, 5, 6. In addition they only have to backfill through February 15. Which months is our state test administered? March-April-May. High schools are required to backfill even less. They only are required to backfill through 9th, so no new students in 10, 11 or 12th grade. You have done a great job unpacking the limited use of the Departments data on their webpage. 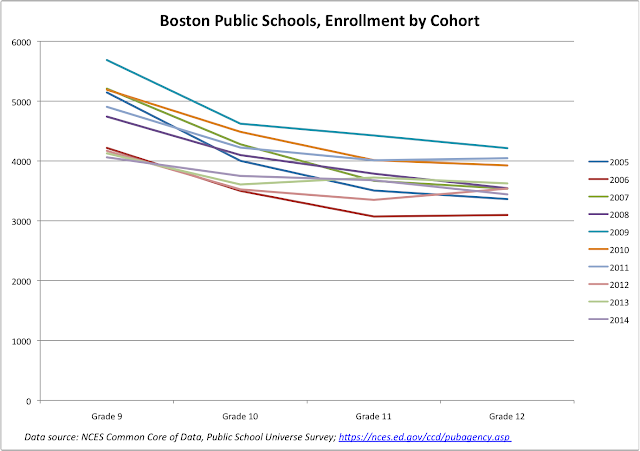 We have also tracked cohort enrollment by year from the DESE webpage and show similar patterns of large numbers of families 'choosing' to unenroll every year. No comprehensive data exists on what happens to those families and why they are leaving. The DESE definition of attrition is how many kids are enrolled in June and return in September. Not how many begin with a cohort and are still there when the cohort graduates. These comments are really for you and your work. I wasn't sure how to contact you. Let me know if I can be of any help. I am a Boston Public School parent and have been on the debate circuit these last few weeks for NoOn2, the charter ballot initiative. Can't wait until the election is over. 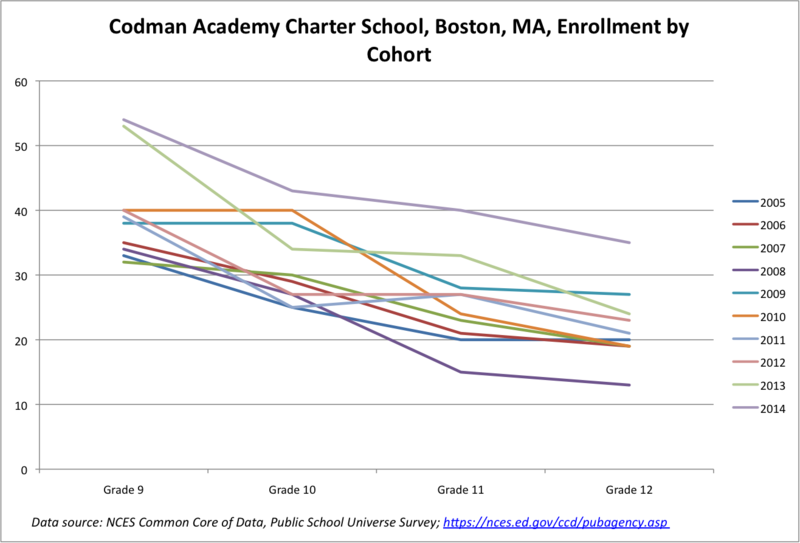 These data are similar to the data posted by John Lerner on the Citizens for Public Schools website in which he compares the cohort attrition to rising MCAS scores. If we wish to understand attrition rates at schools in Boston, rather than mingling members of multiple incoming entering classes in unknown ratios into a single starting "cohort", won't we achieve far more reliable results by examining Massachusetts Department of Elementary and Secondary Education (DESE) attrition data that shows for each school how many leave during the summer, plus its stability rate data for how many stay enrolled during the school year? In my prior message I pointed to such DESE data for a couple of superb schools: MATCH Charter school and Nathan Hale (traditional public school). 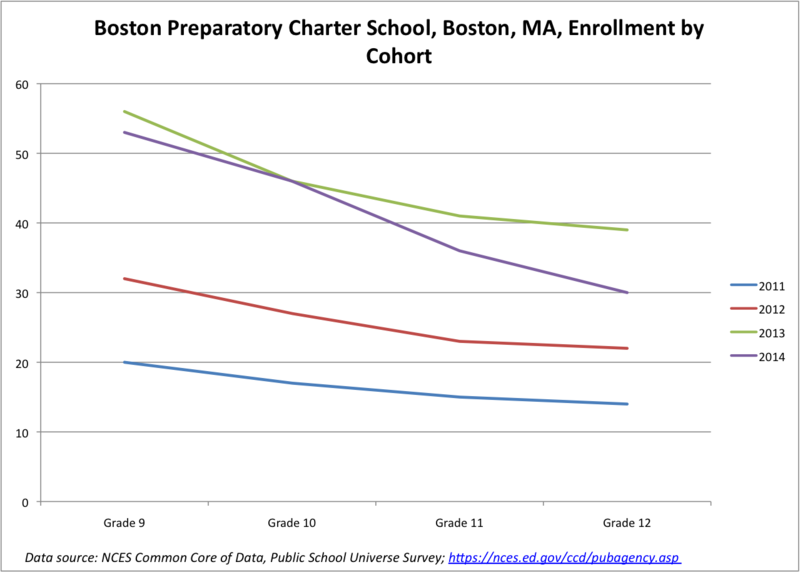 I haven't confirmed that, but have heard no complaint about its accuracy; it seems plausible to me after looking at the rates for a variety of individual schools. Jazzman: "If COAH was retaining students in their freshman year, we would certainly expect a drop in students from freshman to sophomore years. But then we'd expect to see the number of students level off between Grade 10 and Grade 12. Except that's not the case; COAH's cohorts continue to shrink in their upperclass years." So, it appears that throughout the entire summer and school year, COAH does better on every one of those measures than is typically the case for traditional public schools in the same community. COAH was the school you originally cited as a prime example of Commonwealth charter schools losing students. Rather than a poster child for attrition loss aimed at ridding schools of poor performers, COAH is perhaps instead a poster child for the practice of callously dumping high perfomers into college after four years, while keeping the academically less accomplished students close at hand, for at least one additional year. I do concur with a good portion of what you write most recently; it is lack of intake/backfill that explains why, as Commonwealth charter schools lose some students (at a relatively low rate), their enrollments decline in upper grades. The intake/backfill rate at COAH was just 1.7%. Intuition alone irresistably inclines me to favor some of these hypotheses to some degree. But the data I consult fails to provide much additional boost. 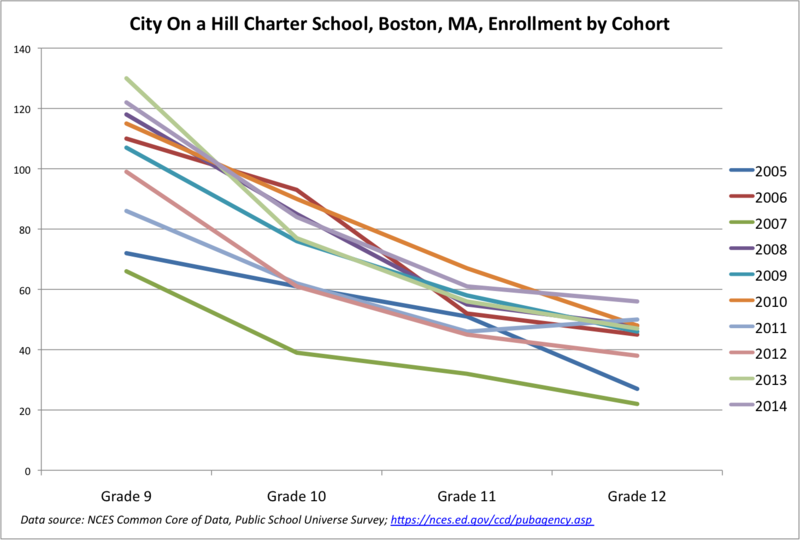 I have heard it asserted by others with pitbull persistence that the highest performing charters assuredly have the highest attrition... They must attain the highest performance by most sweepingly pushing out the least scholarly scholars. Though that's plausible, the Boston data runs contrary. 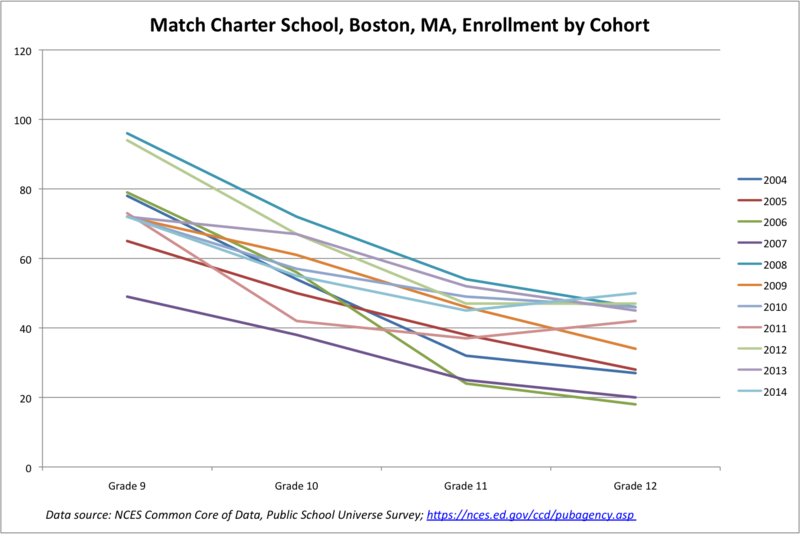 In Massachusetts, DESE constructs a numeric percentile score that aims to rank schools against others statewide that serve the same or very similar grade levels. My understanding is that it derives from a complex blend of test scores, growth, graduation rates, etc. that's tough to decipher, and that I might quarrel with if I fully understood it. But it's the best single score I can find for purposes of ranking schools as to how much better kids read, write and calculate as they progress through school. 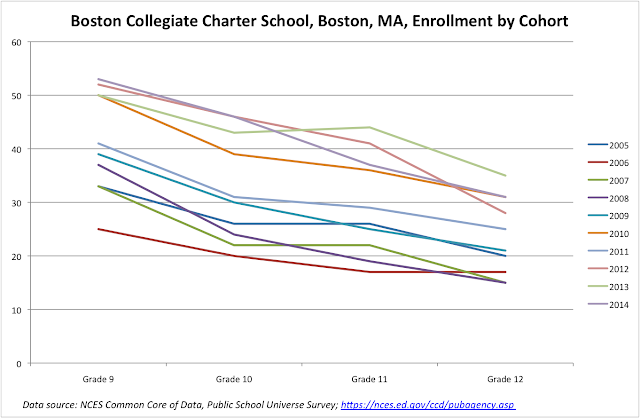 So here's that score for Boston's 2015 Commonwealth charter schools in the first column, and in the second column, DESE's attrition score for the same score. Would be pleased if you'd throw those in a scatter chart here, JJ. OK, no positive correlation between attrition and performance there. 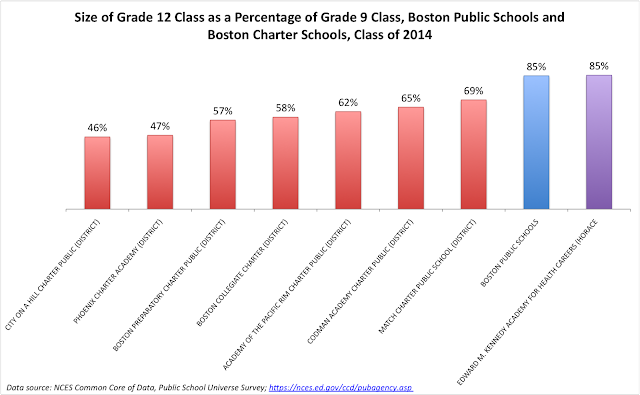 We could imagine that the impact is via school-year rather than summer loss, but with only 82 students total in all grades leaving all Commonwealth charter schools in the city during the school year, that's not a compelling putative explanation. So, what about the possibility that, what relatively little attrition there is, is hyperconcentrated among the lowest performing students... and that a peer mix more conducive to effective learning is thus enhancing academics among those who remain? 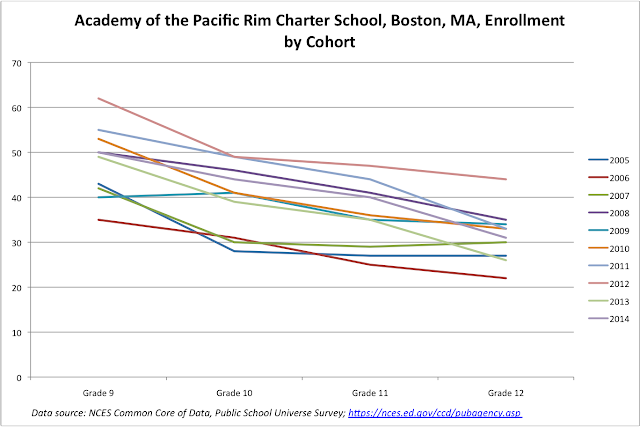 It seems consistent with available evidence that kids who are struggling academically at traditional schools are more likely to be retained and then drop out of school, in contrast to at charter schools being retained and then, thanks to strong and sustained intervention, hanging in there till graduation. One could reasonably suppose that the circumstance is far different in elementary/middle school where dropping out isn't an option. 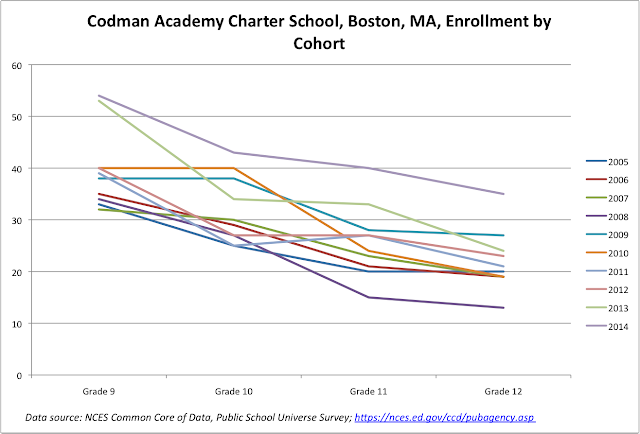 But the notion that charter schools are aggressively 'counseling out' or otherwise removing the lowest performing students doesn't seem supported by what we find at the schools at the very top of the list of comparative performance I provided above. Wish we could insert those graphs here and see how well your readers' friends could distinguish between "Stayed" and "Left" if those were covered. The economics of whether it's preferable to anticipate short-term monetary savings via a school system where kids are more likely to drop out of school, or instead bear the burden of a school where kids are more likely to be retained for an extra year and graduate is one I'd be glad to take up with you, JJ, if I thought there'd be a controversy. But I anticipate we'd reach swift agreement. 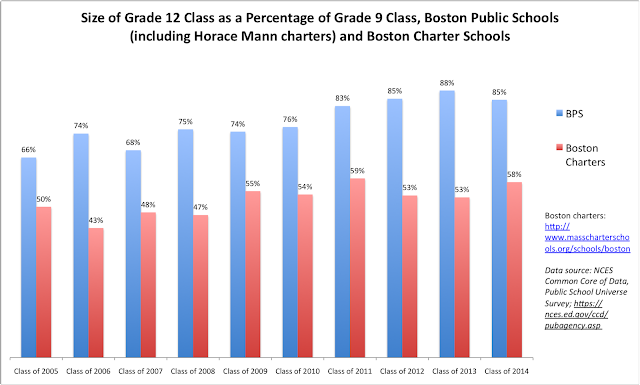 Boston's Commonwealth Charter schools: Excellent principals. Effective teachers. Lots of time with the kids. Results that parents passionately appreciate. Can we find that in the Boston district schools also? Of course! Nathan Hale Elementary! New Mission High! I could go on. And on. But not as long as we might wish.